Day 282—9 August 2012 "Old" friends Tom and I had a most lovely evening with college friends Mike and Valerie, along with their kids, and Val’s mom (our kids were at their respective rehearsals). We met in Alpha Phi Omega (National service fraternity), where we worked and played hard together. 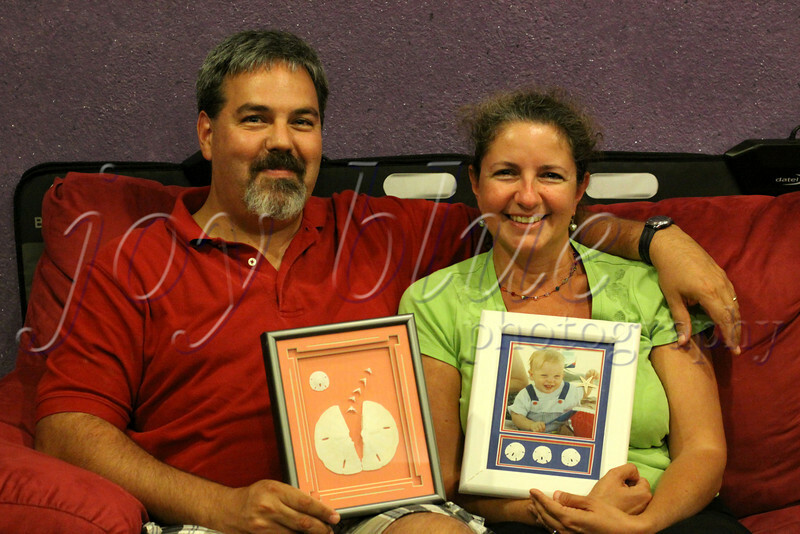 They are holding artwork they made for us up to 18 years ago. The pieces hang between our medicine cabinets, where we enjoy them every day. On the right is baby NOS on the beach of Cape May, NJ. We’ve had one visit with each other since that vacation (with additional kids on the scene); we’re hoping that we can manage to see each other more than once a decade from here on out!